Certified copy of the discharge of Nathaniel Richmond from the Army of the Revolution in 1783. This copy was dated Jan 25, 1823. From American Revolutionary patriots discussed by Raymond Davis in this biography of Madison County. Directions: Falls Cemetery (now old part of Grovelawn)--south of I 69 on E side of Pendleton Ave., S of Co. Rd. 600S. The unmarked graves of Elijah Boston, Philip Hobaugh, William Wall are in this old part. 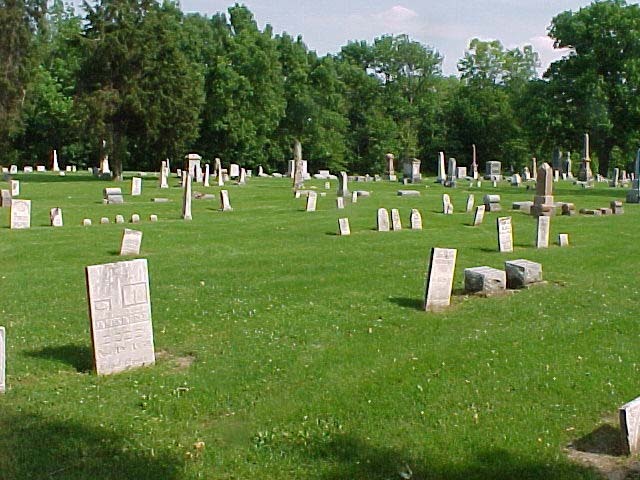 The thirteen included on our web site Pioneers Cemeteries and Their Stories, Madison County, Indiana. were initially researched by Madison County historian Raymond Davis. Nathaniel Richmond is the patriarch of a family with several descendents of that name. Nathaniel has a DAR commemorative plaque and stone, placed by descendents, under the flag in the military section in the west half of Grovelawn. Nathaniel was born in Middleborough, Massachusetts, in July of 1763. He was a member of that state's 2nd Regiment and saw action at the battles of Valentine Hill and White Plains. His discharge was signed by George Washington, and he is listed in the DAR Index of Patriots. Nathaniel married Susannah Lombard in 1783. When Indiana first opened for settlement, he and his family moved in. He is first recorded in Dearborn County in 1818 and then in Fayette County in 1821. Sometime in the early 1820s, Nathaniel found his way to Pendleton and decided to stay there with his family. Several of his children are listed in the records of Fall Creek Township. Nathaniel died in September of 1829; his widow was still a resident a decade later. 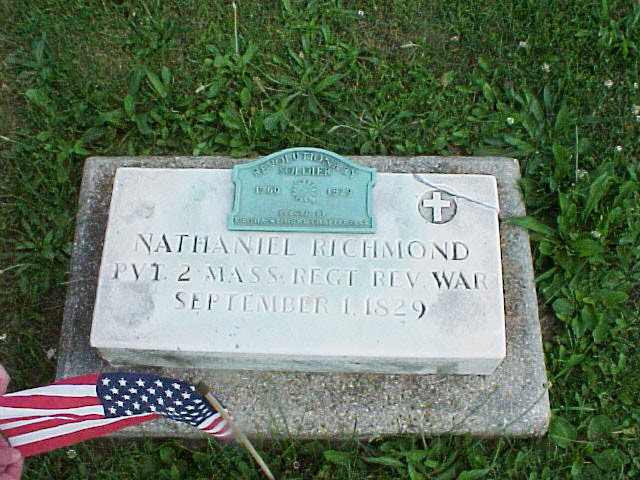 The DAR commemorative plaque and stone for Nathaniel Richmond is located under the American flag in the military section of Grovelawn. The cross in the corner of his stone indicates that he was a minister. Several of Nathaniel's descendents are also recorded as religious leaders. Nathaniel's original burial site was on the homestead west of Pendleton. His grave was moved at the early 20th century.